Editor’s note: This is a guest post from Mark “Mantic59” Herro. The “grain” of the beard–the direction(s) the hairs grow in–can be completely counter-intuitive when it comes to the neck. They can even sometimes grow in a circular pattern. 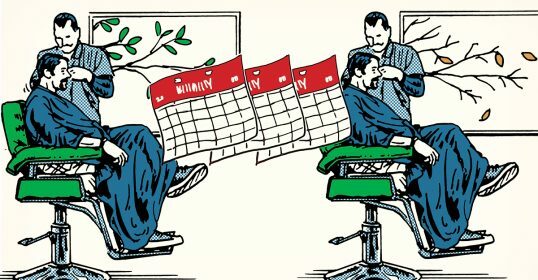 Understanding how the hair grows on your neck is the first step in overcoming shaving problems there. To accomplish this, create a map of your beard with a mapping aid like this one. Using a mirror and gentle circular motions of the fingers, determine the direction(s) your beard is growing in and sketch that onto the face map. Writing arrows in the direction of growth in each box will help you understand how to best shave those areas. Shaving with the grain initially is one of the basic concepts in shaving, particularly important if you are using a multi-blade cartridge razor. It’s a bit less important with a double-edged razor (you can “cheat” a little and follow the predominant direction without worrying about every twist and turn), but still necessary to keep in mind. Reducing the beard in stages is the key take-away here. Properly preparing the skin of the neck is often overlooked: copious amounts of hot water or gently cleaning the skin on the face doesn’t get to the neck. Pay attention and be sure that warm towel or “barbershop prep” lather covers the neck! Some shavers troubled by ingrown hairs on the neck should try a good, thorough scrubbing of the area before putting razor to skin. I’m not a big fan of pre-shave oils, but some have found that applying some on the neck helps reduce irritation. Wet your face, apply the oil, and then apply your shaving cream. Consider, after a normal prep, using cold water to shave with. Some shavers have reported a significant reduction in irritation with cold water shaving. 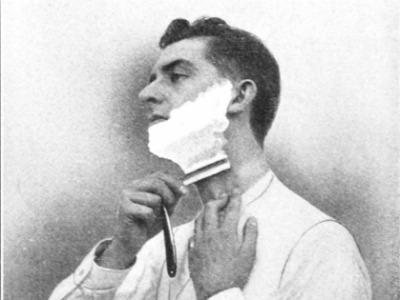 Here is the Art of Manliness guide to cold water shaving. First, what do I mean by a “gentle” razor? In the world of DE shaving, some razors have a reputation for being “gentle” because they’re engineered to expose less of the blade edge when shaving. While you won’t get as close of a shave with a gentle DE razor, it’s definitely much more comfortable and causes less irritation. Some popular gentle razors include the Merkur Classic, Weishi, and many of the vintage Gillette safety razors. On adjustable DE razors you can adjust the razor for a gentler or more aggressive shave. Dial down for a milder shave on the neck, then dial up for other parts of your face. One of the things you can do to further reduce irritation when shaving on sensitive areas like the neck is to combine a gentle razor with a high performance razor blade like the blades from Feather. A gentle razor that doesn’t expose much blade to the skin, coupled with a high performance blade, provides a much more efficient cut, reducing the chance for irritation. Adjusting a cartridge razor (like a Gillette Fusion) in this fashion is tougher as the variety of available blade sources is limited. If you’re using a cartridge razor, your best bet to reduce irritation is to go with a cartridge with fewer blades. However that is not “etched in stone,” so some experimentation may be necessary. Let’s face it — the neck is not a flat area; it’s a terrain of curves and odd angles. 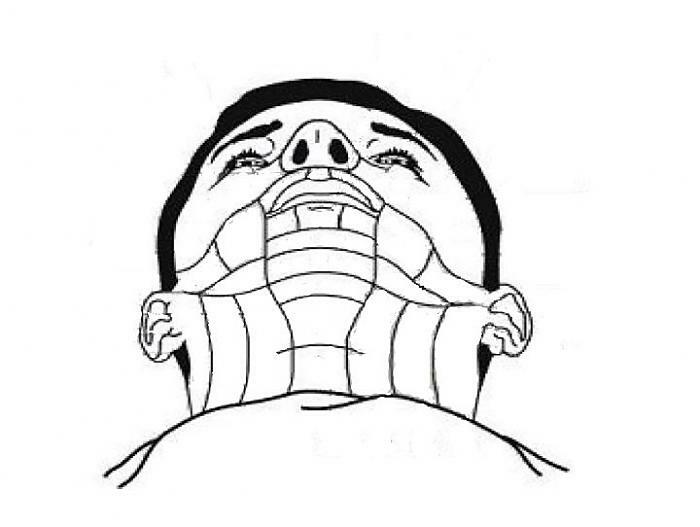 Many shavers will tilt their head upwards to pull the skin of the neck taut. This may help, but it doesn’t really flatten the area. Instead, try leaning forward and tilting the head back SLIGHTLY. Shorter strokes on the razor may also help cover flatter areas more consistently. No pressure means NO PRESSURE! This is not for everyone, but if you have small areas of stubble or rough patches, you can try some techniques like “J-Hooking” or “Blade Buffing” to cover those areas without re-shaving–and possibly getting irritation–over a wider area. However, over-doing these advanced techniques can be a prescription for trouble if not done carefully and judiciously. A very thorough rinsing of the neck with warm water after the shave (before applying aftershave) will help remove any remaining lather residue, particularly important for those prone to ingrown hairs. I personally go one step further: after the warm water rinse, I soak a cotton pad in witch hazel and wipe down the area. You may be surprised what the pad picks up. Follow with a brief cool water rinse and aftershave product. What have you found that improved your shave on the neck?